I don't know if it's possible for a knitter to have too many stitch dictionaries, and 400 Knitting Stitches by Potter Craft is a decent one to add to any knitter's collection. As advertised in includes 400 different stitch patterns, from the basics like Stockinette, Garter and Moss Stitch to fancy cables, lace and slipped stitch designs. 400 Knitting Stitches begins with some basic definitions and instructions to help knitters of all skill levels understand the patterns they are about to see. This section includes things like definitions of row and gauge, hints for reading patterns and following charts, ways to cast on, knit, purl, bind off, twist stitches and pick up dropped stitches. It also includes information on the patterns such as why they're organized in a particular way, the difference between the wrong side and the right side of a knit fabric, how to work diagonals as opposites and how pattern repeats work for symmetry and continuity of pattern across a knit fabric. Some of those categories are pretty self-explanatory; others you might not have heard used before. Double stitches, for example, is the term used for stitches that involve working stitches from the row or rows below the current working row. Each pattern indicates how many stitches are needed to continue the pattern across a knit fabric, as well as how many edge stitches to add if necessary for seaming a project together. The patterns are given in row by row written instructions as well as charts, with the key to the charts shown at the back of the book. Using both words and charts makes the book accessible to knitters of all skill levels and comfort zones, but the charts are so tiny that they're sometimes not very useful. It would, however, be pretty easy to make a copy of the page you need and enlarge the chart, which would probably make following the pattern a bit easier, too, because the book has regular binding and won't stay open to the page you need very well. 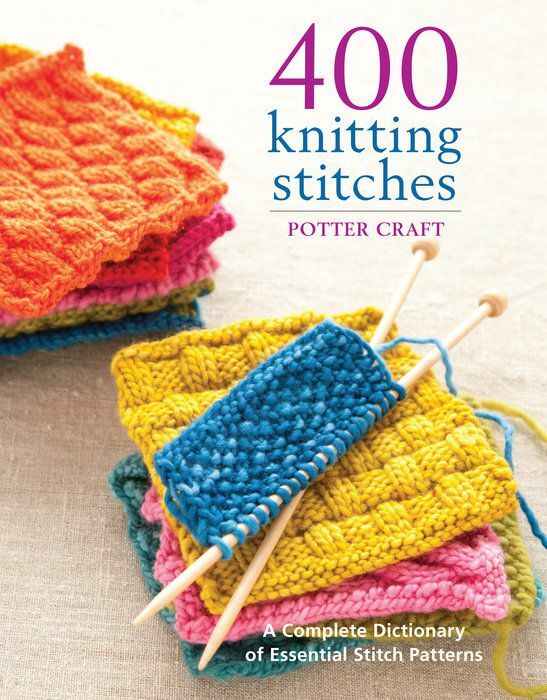 400 Knitting Stitches is a great addition to the bookshelf of any knitter who enjoys looking at and playing with different stitch patterns. The pictures of the stitches are great, but the small print and charts may make this book more difficult to use for some knitters. Some of the instructions may not be that clear, as well, if you're a newer knitter working one of the fancier stitches where you work stitches in a different order or from a different row than is presented on the needle. It won't replace some of the classics on your shelf, but it may give you some new inspiration for projects and show you things you didn't know that you could do with the relatively basic stitches that make up all knitting.